The 2016 Hawaii Legislative Session started on January 20. It’s hard to believe, but 2,658 bills are under consideration in the House of Representatives and 2,371 bills are up for debate in the Senate. Last week, I highlighted bills that affect our taxes and our pocketbooks. This week, I’m focusing on bills that influence education in Hawaii. It would be impossible for me to read every bill in such a short time, so I’m relying on bill summaries to accurately reflect a bill’s intentions. Here is an overview of the significant education bills being proposed in the 2016 Legislative Session. I’ve divided the bills into five sections: 7 proposals that should help students, 2 proposals that may hurt students, 6 proposals that could help teachers, 4 education proposals that increase the burden on taxpayers, and 2 proposals in which schools are taking over for parents. If I’ve missed any important bills, please let me know! Fewer standardized tests, more instruction time. HB2730, SB2586, and SB2592 limit public school student participation in standardized tests and prohibit the use of standardized tests scores for evaluation purposes. Smaller classes, more teacher time. HB2732 and SB2597 establish maximum student enrollment per school class beginning in 2020. Money matters to high school students. HB1402 establishes the Hawaii Public Schools Financial Literacy Task Force. HB2442 creates a pilot project to create credit unions for high school students. Promoting good citizenship. HB857 and HB1122 require high school students to pass a civics test. Shaking it up in middle school. HB1436 requires public school students to take physical education and health education classes in grades 6, 7, and 8. Encouraging student innovation and invention. SB1278 establishes Makerspaces in public libraries. SB2010 establishes the Hawaii Project for Robotics Education. Voting rights for student board members. HB1200 and SB834 give voting rights to a student member of the Board of Education (BOE). SB820 increases the number of public school student representatives on the BOE from one to two. Mandatory preschool (or is it really daycare?). SB2586 requires all eligible children to attend preschool by 2020. Tests, tests, and more tests. HB1159, HB1406 HD1, and SB1243 require the BOE to administer standardized tests early in the school year. Classroom supplies reimbursements. HB13, SB821 SD1, SB2624, and SB2733 offer tax credit for school teachers of up to $500 for out-of-pocket classroom supplies. Housing vouchers for teachers. HB1016 HD1 and HB2510 create a housing voucher program for full-time classroom teachers. Student loan relief for teachers. SB1056 SD1 establishes an incentive program that provides for incremental loan repayment for teachers serving in high need areas of Hawaii for up to 10 years. Debit cards for classroom supplies. SB2593 allows public school teachers to use a debit card to purchase classroom supplies. Teachers take back your classrooms. HB1334 allows teachers to exclude from the classroom any student who engages in disruptive or threatening behavior. Higher wholesale general excise (GE) tax. SB1317 increases the wholesale GE tax from 0.5% to 1.0% in 2016 and 2017 for infrastructure development and public schools. Higher retail GE tax. HB2731, HB2733, and SB2599 Increases the GE tax by 1% for DOE operations. HB1240 increases the GE tax by 0.25% to provide a dedicated funding source for the DOE. SB2586 increases the GE tax by an unspecified amount for public education. Higher property taxes. HB2065 and SB2292 authorize a surcharge on real property taxes to fund public school capital improvement projects. Is it preschool or taxpayer-funded daycare? HB1401 appropriates $17 million each year ($3.4 million to each of five preschool programs). HB1786 and SB2227 appropriate an unspecified amount for the Preschool Open Doors Program. HB1715 appropriates $6 million for the public prekindergarten program. Physical exams required for seventh grade. HB578 HD2 SD1, HB1948, and SB2387 require a child to have a physical exam prior to entering grade 7. HPV mandatory for seventh grade. HB1910 and SB2316 require a child to receive at least one dose of the Human Papillomavirus vaccine (HPV) prior to attending grade 7, beginning in 2017. If you feel strongly about an issue, please speak up! Contact your state senator and representative by phone, mail, or email. Talk to your family, friends, co-workers, and neighbors. Write to a local newspaper or magazine. This year, I’m highlighting bills that focus on taxes, education, individual rights vs. government powers, and (in my opinion) controversial issues. It would be impossible for me to read every bill in such a short time, so I’m relying on bill summaries to accurately reflect a bill’s intentions. Here is an overview of the significant tax bills being proposed in the 2016 Legislative Session. There are over 45 income tax credit proposals, over 15 General Excise (GE) tax exemption proposals, and proposals to increase and decrease taxes and fees – a jumble of tax savings and tax increases, but all of it meaning more paperwork and forms. I’ve grouped the bills into three sections: 6 tax proposals we should fear, 6 tax proposals that help Hawaii taxpayers, and 12 tax proposals to watch for – the good, the bad, and the ugly. If I’ve missed any significant bills, please let me know! General Excise (GE) tax on Internet purchases. SB259 would allow Hawaii to adopt the Streamlined Sales and Use Tax Agreement to tax online purchases. Increases to the retail GE tax. HB2731 and SB2599 would increase the GE tax from 4% to 5% to fund Department of Education (DOE) operations. HB 330 would increase the GE tax from 4% to 5% for a two-year period to provide a dedicated funding source for the acquisition of agricultural lands. HB1240 would increase the GE tax by 0.25% to provide a dedicated founding source for the DOE. Increases to the wholesale GE tax. HB1137 would increase the wholesale GE tax from 0.5% to 1.5% to fund Hawaii’s unfunded liabilities for the EUTF and ERS. SB1317 would increase the wholesale GE tax from 0.5% to 1.0% in 2016 and 2017 for infrastructure development and public schools. Surcharges on real property taxes. HB2065 and SB2292 would raise property taxes to fund public school capital improvements projects. HB2210 would raise property taxes collected from oceanfront properties to fund coastal protection. In 2059, you may owe GE taxes you didn’t know you owe. HB968 HD2 SD1 would make a taxpayer liable for any amounts passed on and separately stated as the tax owed by the taxpayer for the transaction in a receipt, contract, invoice, billing, or other evidence of the business activity. There’s also a civil penalty and reporting of violations. More GE tax paperwork and higher fees. SB2927 requires that GE tax licenses be renewed annually. No GE taxes on wholesale transactions. HB1915, HB1973, SB946, and SB2705 repeal the GE tax on all intermediary business transactions. No GE taxes on food and medicine. HB419 proposes GE tax exemptions for food starting in 2020 and for medical services starting in 2018. HB1922 proposes GE tax exemptions for food starting in 2021 and for medical services starting in 2019. HB477, HB984, SB957 propose GE tax exemptions for food, while SB2006 proposes GE tax exemptions for certain food or food ingredients. HB1062 and SB2054 propose GE tax exemptions for medical services. Encouraging businesses and economic growth. HB470, HB1977, and SB958 repeal the corporate income tax. HB2667 and SB3012 reduce the corporate income tax rate by 50%. Helping seniors who worked and saved. HB245 excludes retirement income from the state income tax for taxpayers 65+ years. No penalty (double-taxation) for dying. HB476, HB1978, SB959, and SB2710 repeal inheritance and state taxes. A supermajority required to raise taxes or create new taxes. HB423 proposes a constitutional amendment to include a two-thirds supermajority voting requirement for the legislature to pass laws that raise taxes or create new taxes. GOOD: Tax at every level of production vs. retail sales tax. SB529 and SB1222 create a tax reform task force to review the general excise (GE) tax versus a sales tax. BAD: Keeping visitors away from Hawaii. HB2702 and SB2945 increase the Transient Accommodations Tax (TAT). GOOD: Tax credit for teachers. HB13, SB821 SD1, and SB2624 give school teachers a tax credit of up to $500 for out-of-pocket classroom supplies. BAD: Surcharge on wireless phones. HB431 imposes a prepaid wireless 911 surcharge of 1.2% of each retail sale. HB2276 and SB2805 impose a 66¢ surcharge for E911 per prepaid wireless transactions. SB193 SD2 HD2 imposes an unspecified prepaid wireless E911 surcharge per retail transaction. GOOD: Encouraging diversity in hiring. HB343, HB1870, and SB2219 offer a tax credit for six months for hiring an individual with a disability. HB1276 HD1, HB1871, and SB2218 offer a tax credit for an individual age 65 or over. BAD: Dollars for voting – can we trust the vote of someone who was bribed to do it? HB789 would offer a tax credit for voting in elections. GOOD: Calling all doctors. HB1073 offers a temporary income tax exemption for physicians and osteopathic physicians who relocate and practice in Hawaii. BAD: Higher taxes for a bigger social program. HB1253, HB1885, SB272 SD1, and SB2478 establish a long-term care surcharge on state tax to pay for claims for defined benefits under the long-term care financing program. GOOD: A helping hand for farmers and food security. HB2117, SB224 SD1, and SB2440 offer a tax exclusion for the first $50,000 earned to farmers earning less than $200,000. BAD: Higher taxes for drivers. HB2409 and SB2938 increase the State Fuel Tax and State Motor Vehicle Registration Fee, and state motor vehicle weight tax. UGLY: Warning ahead – higher GE taxes possible. HB320 and SB426 extend the deadline to establish a county surcharge and increase the maximum surcharge from 0.5% to 1.0%. UGLY: Politically self-serving. HB2600 allows an income tax deduction for political contributions. January marks new beginnings in our lives and in government. While we struggle with sometimes life-changing New Year’s resolutions, government has to convince us that their “resolutions” are the best priorities for our nation and our state. Government has to persuade us they have accomplished much in the past year, and that they have a plan for the future. It’s interesting to compare President Barack Obama’s last State of the Union Address on January 12, 2016 with Hawaii Governor David Ieg’s second State of the State Address, given on January 25, 2016. I read the text of the addresses, so that I could focus on the words and not the delivery. Opening remarks. President Obama begins with humor, a touch of wryness, and an acknowledgement that it is election season. Governor Ige begins on a somber note, with the end of sugar production on Maui. Some of Obama’s solutions include “Pre-K for all,” hands-on computer science and math classes, great teachers, two years of free community college, stronger Social Security and Medicare, finding a cure for cancer, raising the costs of coal and oil, protecting the American people, going after terrorist networks, congressional districts drawn by bipartisan groups, and limits on campaign contributions. Hawaii priorities. With three more years ahead of him, Governor Ige was more extensive in his vision for Hawaii. He identified seven broad themes of truthfulness, running government as a public trust, working with the community, governing with compassion, taking care of our children, building a legacy, and value-based actions. Each theme is subdivided into more specific issues facing Hawaii. For instance, under Legacy Building, Ige identifies the issues of tourism, agriculture, the military, and the economy. Some of Ige’s solutions include funding public pension and health benefit funds, a tax modernization program, spending federal funds in a timely way, more affordable housing, cooler classrooms, and an Invasive Species Authority. The most compelling idea is the redevelopment of Kalihi – relocating the Oahu Correctional Facility and redeveloping the land for affordable housing, recreation, commercial development, and/or educational use. Taking responsibility. President Obama’s biggest acknowledgement of failure is that “the rancor and suspicion between the parties has gotten worse instead of better.” After just one year in office, Governor Ige focuses on the ways he is responding to problems he inherited from previous administrations or couldn’t resolve in the past year, like the Thirty Meter Telescope, affordable housing, and overheated classrooms. Closing remarks. President Obama stresses his belief in the American people’s goodness and decency, with general descriptions of hard-working, open-hearted people who are “busy doing the work this country needs doing.” Governor Ige spotlights the leadership of the late teacher Ron Bright and his commitment to values, but takes a circuitous route to (I think) call for “the unyielding affirmation of diversity” – asking us to accept and respect our differences with aloha. Did you agree with the priorities outlined in President Obama’s State of the Union Address? What would you say if you were called on to give Hawaii’s State of the State Address? Through writings and conversations with broadcast journalist Pamela Young, former Kalaupapa resident Makia Malo shares his inspirational story in “My Name is Makia: A Memoir of Kalaupapa” (2011). Elroy Makia Malo was born in 1934 and grew up in Papakōea, Hawaiian Homestead land behind Punchbowl on Oahu, Hawaii. In 1947 at age 12, he contracted leprosy, or Hansen’s disease – also known in Hawaii as ma’i Pākē (the Chinese illness) or ma’i ho’oka’awale ‘ohana (the sickness that tears families apart). He was sent to live at Kalaupapa on the island of Moloka‘i. Makia, two of his brothers, Bill and Pilipili, his sister Beka, and later his mother Mary contracted leprosy. Over the years, he lost his toes, fingers, and vision. Since 1865, leprosy patients in Hawaii were exiled to the Makanalua peninsula on Moloka‘i. At Kalaupapa, there was school three hours a day, movies twice a week, and a lot of time spent swimming and hunting. The books were old, discarded from public schools; the cars were rebuilt with wood when they deteriorated. The residents of Kalaupapa built their own community and took care of each other. In 1971, Makia left Kalaupapa for Hale Mōhalu in Pearl City, Oahu, where he experienced a new kind of freedom. Leprosy didn’t stop Makia from graduating from college, falling in love, and becoming an instructor, poet, and storyteller. As a young man, he married Ivy, another patient, but their marriage fell apart. With the help of a physical therapist, he dictated his first story in 1969 and won a writing contest. He transferred to Ho’opono Rehabilitation Center in Liliha, Honolulu, and received blind-training. He fell in love with Sharon (name changed), a nurse’s aide at Queen’s Hospital, and lived in Makiki, but they divorced three years later. He was accepted at the University of Hawaii and majored in Hawaiian language. He tutored Hawaiian language, studied for a teaching certificate, and performed with auntie Nona Beamer. In 1990, he married heiress Ann Grant. He started to write down his stories using a Morse code computer. He never knew how sick Ann was from cervical cancer until she died in 2008. Throughout his writing, Makia shows optimism and a strong appreciation for the good things in his life. He seems to feel little bitterness or resentment about his disease, and has found his purpose: to share his experiences and teach others about the Hawaiian language and culture. Makia was proud to attend Father Damien’s pre-beautification celebration in Belgium in 1994 and then Saint Damien’s canonization at the Vatican in 2009 – a man who stayed to comfort and care for leprosy patients, and who contracted leprosy himself. 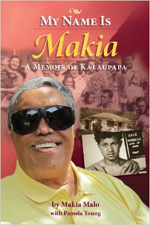 The memoir includes some of Makia’s poetry and stories, and concludes with interviews with other Kalaupapa residents. *I received this book through a giveaway sponsored by Legacy Isle Publishing. 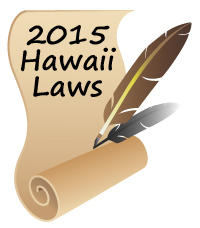 The 2016 Hawaii Legislative Session started on January 20. We’re in for another 16 weeks of discussion, debate, testimony, promises, and compromises until May 5, when the Legislature adjourns. * Out with the old and obsolete. Act 22 amends tax laws to delete obsolete and unnecessary provisions. Act 35 corrects errors and references, clarifies language, and deletes obsolete or unnecessary provisions in the Hawaii Revised Statutes and the Session Laws of Hawaii. * Encouraging local farming. Act 31 includes traditional Hawaiian farming systems, traditional Hawaiian crops, and small-scale farming to the Hawaii state plan objectives and policies for the economy. * Seeing is believing. Act 39 requires open movie captioning for the hearing-impaired in motion picture theaters. * Don’t blow any smoke. Act 19 prohibits the use of electronic smoking devices in places where smoking is prohibited. Act 123 prohibits smoking and electronic smoking devices within the state park system. * Better for our cars and fuel efficiency. Act 161 repeals the existing requirement that gasoline for motor vehicles be composed of 10% ethanol. * Higher fees and taxes fees. Act 240 extends the 0.5% county surcharge for rail transit by five years to 2027. Act 42 authorizes the counties to establish and charge user fees for stormwater management. Act 93 increases the transient accommodations tax (TAT) on resort time share vacation units by 1% each year to gradually achieve a rate of 9.25% of the fair market rental value. Act 223 repeals the refundable food/excise tax credit for individuals with adjusted gross incomes of $30,000 or above and for heads of households, married couples filing jointly, and married couples filing separately with adjusted gross incomes of $50,000 or above. * Authorizing special purpose revenue bonds for Anaergial Inc. for renewable non-fossil fuel production on Maui (Act 72); Chaminade University of Honolulu (Act 73); Hawaiian Electric Company Inc., Maui Electric Company, Ltd., and Hawaii Electric Light Company Inc. (Act 75); and Waimea Nui Community Development Corporation for $45 million (Act 207). * It’s not the end for a failed program. Act 76 appropriates funds for the operations of the Hawaii Health Connector. * Billboards – a foot in the door? Act 37 authorizes the display of an outdoor advertising device at the Waipio Peninsula Soccer Stadium. * Behind closed doors. Act 88 authorizes the Employees’ Retirement System Board of Trustees to hold a meeting closed to the public to discuss or decide upon certain matters. * Never too young to learn. Act 109 establishes the Executive Office on Early Learning Public Prekindergarten program. Act 139 appropriates $2 million (over two fiscal years) for the Hawaii Keiki: Healthy and Ready to Learn program. Act 191 appropriates $6 million for fiscal year 2015-2016 for the Preschool Open Doors program. * Too young to smoke. Act 122 increases the minimum age for smokers from 18 to 21 years. * Legalizing the illegal. Act 172 creates a limited purpose driver’s license (not acceptable for federal identification and voting purposes) without a proof of lawful presence in the United States. * Feeling good in the neighborhood. Act 5 designates October 2 as Mohandas Karamchand Dandhi Day. Act 6 designates the ukulele as the official auana musical instrument and the pahu as the official kahiko musical instrument of Hawaii. Act 7 designates December 20 as Sakada Day. Act 13 designates the ʻōpeʻapeʻa (Hawaiian hoary bat) as the state land mammal. Act 145 authorizes the issuance of special license plates for Haleakala National Park and Hawaii Volcanoes National Park. You are currently browsing the Better Hawaii weblog archives for February 2016.